Ah, Spring! 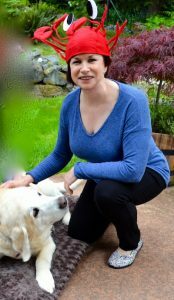 You know what spring means to me (other than the fear a late frost will kill the tomatoes I planted?) It means it’s time for our annual crawfish boil! Proving that you can take the girl out of Texas, but you can’t take Texas out of the girl, I got out my festive crawfish hat. Because you can’t eat crawfish without proper adornment. Ritter Dog obviously is wondering at my headgear. 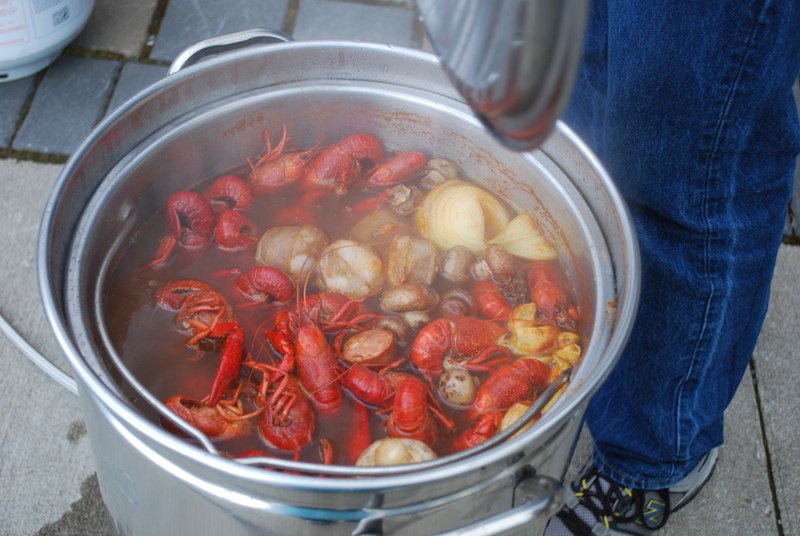 For the uninitiated, a crawfish boil takes place outside and involves vast quantities Cajun spice and crawfish, boiled together in an outdoor cooker with small ears of corn, red potatoes, mushrooms and andouille sausage, then flung on plywood tables covered with butcher paper. 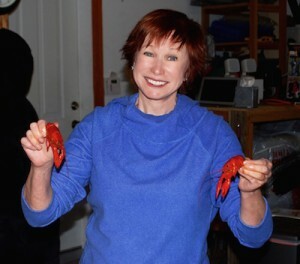 It takes a few minutes to learn how to eat a crawfish, but once you do — man, they’re wonderful! And the best part, IMO? They’re so small you can eat for hours. 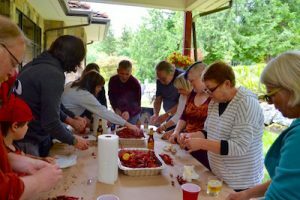 It seems that word about crawfish has got around in our little corner of Western Washington. The crowd was huge. As fast as we could boil up the crawfish, they ate it. It was like watching a shark feeding frenzy on the Discovery Channel. Crawfish boils in Texas usually involve a lot of sweat. Spring is hot in Texas. Not so in Washington. Usually, it’s cold. Frequently, it’s raining. Guests alternate between rushing to the tables and warming their hands by shelling hot crawfish, and huddling around the propane heater, warming their frontsides and then their backsides. This year, it was warm! And dry! Once the sun set, we lit the heater and the sweatshirts came out, but after folks had satisfied their keenest appetites — and before the homemade chocolate chip cookies and Blue Bell ice cream came out — they settled down in the kitchen to visit and color on the butcher paper-covered table. Spring … Crawfish heads and empty corn cobs flying into the giant trash cans strategically placed. Guests trying to horde hot crawfish. And good friends lining up around the esteemed chef to grab spicy mushrooms and andouille sausage from each fresh batch. I really love Spring! Next up — the summer solstice in the stone circle!